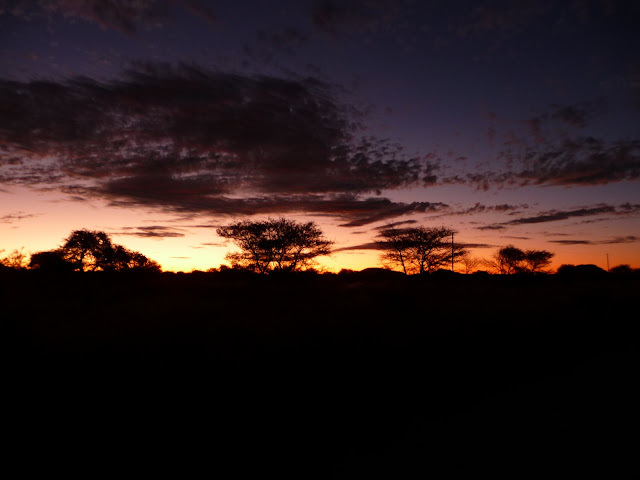 The following is trip report for a first time African hunter. I suspect that my wild-eyed amazement over the experience likely leaks out in the report. I’m going to do this in two parts – one extremely brief and one less so. The short story is that I had a trip that was outstanding in every aspect. The outfitter, accommodations, food and hunting were all incredible. I shot a mature gemsbok bull, a lone mountain zebra and a 51.5″ kudu. The lone lowpoint of the trip was that I muffed the easiest shot of the trip on my warthog, which was not recovered. Pictures of the animals can be found below. The longer report is as follows. It is excerpted from my diary. I MADE IT!!! We arrived at the tent camp at app0roximately 1:15 pm. It took 47.5 hours to get here, but it was worth it. I rested for around 1 hour then we went shoot. The gun shot fine. I am very uncomfortable shooting from the sticks. I’m sure I’ll get more comfortable as the trip progresses. We went for a short hunt. We walked past a warthog burrow. Just after we cleared the burrow entrance, the warthogs exploded from the burrow. It was exciting. We also saw several groups of gemsbok (no shooters), another warthog arrived but it disappeared before we could get a good look at it. We also saw a kudu cow. It was a pretty good day. I saw my first African sunset tonight. It was beautiful. Johann took my picture with the sunset in the background. I took another picture as well. I just had a delicious meal of gemsbok stroganoff and carrots cooked in OJ and spices. Dinner was good. On leaving my tent to go to dinner, I looked up and really saw the stars. The sight was awe inspiring. Day 1 of 11 in Africa has been great. I can hardly wait for Day 2. Today was my first full day of hunting in Africa. I stalked kudu, warthogs and gemsbok. I also saw eland, porcupine and jackals. This is different hunting; you don’t know what is going to pop up next. This morning we saw a big bodied kudu bull. We spent several hours stalking it and 2 groups of gemsbok. The kudu was never seen again. After that, we went to the top of the koppie to look for animals. We saw a kudu cow, a kudu bull and 1 or 2 gemsbok. We left there to look at waterholes for warthog. We went to the first one and there are cattle everywhere. We got close and a jackal starts spooking the herd. Out from the right a warthog sow and then boar shows up. The boar is big (Johann says 11 inches). It ran the jackal off but never settled down. Johann put up the shooting sticks but there was a problem with them, I stepped on the right leg to push it down. Just as I’m ready to shoot, it moves in front of some cattle. We stalked it for a little while, but the grass it way too tall from the exceptional rains. We went to another waterhole where we spooked ~12-15 warthogs. Later, see young boar come in and drink and wallow for a while. It was fun to watch. After lunch, we went back to the koppie to look for whatever. We saw eland and gemsbok. We decided to stalk two of the gemsbok that we had spotted. As we were moving toward where we thought the pair of gemsbok was, Johann spotted a lone gemsbok and the stalk was on for that one. We stalked it for a while before we saw it again in the thornveld. It moved from right to left and didn’t stop in the open, we were hoping for. He continued on when he got to another small opening. Johann and Tjokkie whistled to stop him and I shot. At the shot, his back legs buckled and his feet went up in the air and he disappeared in the tall grass. We waited to see if he got up again, he didn’t. We shook hand and went to find him. The grass is tall 36-40 inches tall and we found him after a short search, he never took a step. The shot was at around 50 yards. The shot was too far forward and broke the spine of the bull. The tall grass made it difficult to see the legs and find the correct spot to shoot. The bullet was retrieved. The front part of the bullet was missing but the core (250 gr patterns) was perfect. It took time to dress it and cape the gemsbok to get him back to camp. He was skinned at Vera’s Father’s home. We got back to camp around 8:00. Johann cooked the liver, it was great. For our main entrée we had gemsbok roast, butternut squash with feta cheese and potatoes, for dessert a pear poached in wine with unsweetened cream. 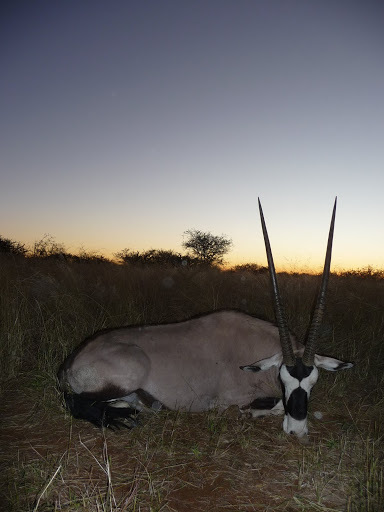 I got a good picture of the sunset while we were getting the gemsbok loaded. I still can’t get over looking at the stars. Tomorrow we’ll try for a warthog and go on to the main camp the next day. Today we hunted for warthog. We climbed the mountain to look for kudu and warthog when the sun was coming up. We saw lots of game from the vantage point: young kudu bulls, kudu cow, eland, hartebeest and a warthog. We started after the warthog and it ran away when we were still very far away. We have no idea what spooked it. The grass is really high so it is almost impossible to spot a stalk the pigs, so we sat at two water holes for most of the day. We took lunch with us and sat at the same hole where we saw the warthog wallowing yesterday. It was dead for a long time. The weather today was much warmer; Johann said ~31C (~88F). We hoped the heat would drive them down to the water. Around 2:00 things really picked up. We saw 9 different boars, but no shooters. Around 3:15, we moved to the waterhole where we saw the big pig yesterday, but we didn’t see anything tonight. Tomorrow, we’ll try again. I saw another beautiful sunset. I took a few pictures; I hope they turn out well. I also got a picture of my shower buddy tonight. There is a gecko that lives behind the shower. Every night when I go to shower, he is waiting for me. Tonight we had the rest of the gemsbok liver for dinner. It was delicious. It tastes different than beef or deer liver. The texture is softer and the flavor is less gamey. It was served in brown gravy over rice with broccoli and cheese on the side. For dessert we had lemon meringue pie. I hope to shoot my warthog tomorrow so we can move camp. Well, I’ve done something that I’ve dreaded. I wounded a warthog and we couldn’t recover it. There were a few pieces of flesh and one drop of blood; that’s it. We tried tracking it for a long time but no luck. All of the sign stopped within 30 yards of the shot. We were sitting at the waterhole and Johann got up to go behind a bush. Tjokkie saw a pig come in from the right. By the time I saw it the warthog reversed direction and disappeared. Tjokkie continued to motion for me. I stood up and slowly walked toward him hoping to get a shot. The warhog had turned to its left and was now coming toward me. It hit an opening a small opening around 20-30 yards away. There was some brush, but I should have been able to make the shot without problem. We believe that I hit the warthog high in the neck. CRAP. We’re going to move camp now. I should be able to hunt this afternoon at the lodge. We moved camp. We left the tent camp around noon. We stopped at a grocery store in Outjo to pick up lunch for the road. I had a sandwich, fries and a couple of bites of a Russian sausage. It tasted like kielbasa. We stopped at Fransfontein, the village where Eva, the cook, lives. It was weird – abject poverty, a bar, a liquor store, a hardware store and several nice houses with satellite TV dishes. On the way to the lodge, we passed a man with 3 children in a donkey pulled cart. The man was talking on a cell phone and wearing an old New York Yankees hat. The place where he was on the phone was in the middle of nowhere. He was probably 40 miles from Outjo which is a small town, much smaller than Greensburg or Lewistown. Everyone over here has a cell phone. Tjokkie and Eva each have one. 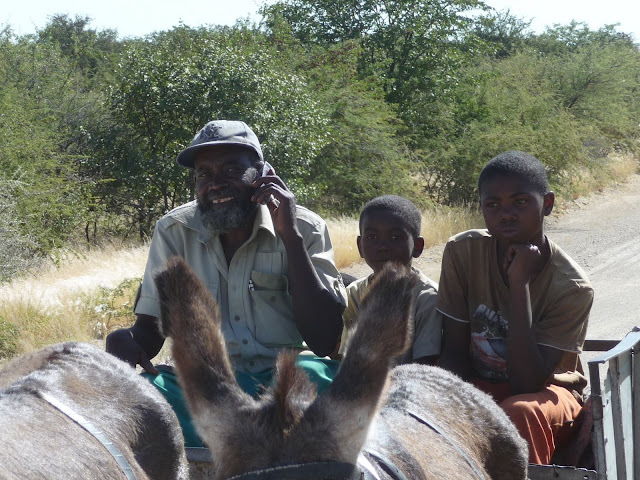 I took pictures of the man in the donkey cart with the cell phone. The lodge is AMAZING. These are the nicest accommodations that I’ve ever had – bar none. I am staying in a chalet. The chalet has a very large bedroom/living room. There is a dressing room and a huge bathroom with a tub, shower, toilet and bidet. We left camp around 4:00 to hunt. First, we went out and I shot a tin can to make sure that the gun was okay. It was. I hit the can resting off of the hunting truck at 100 yards. We drove part way up a mountain and then started walking. We heard zebra and stalked them for an hour. We never saw them. Johann and I continued down the mountain looking for zebra or kudu while Tjokkie went for the truck. Just at last light, we saw a young kudu bull and a cow. After a few minutes, we saw a more kudu. There was a shooter in the group. Unfortunately, there wasn’t enough light. When the bull was courting a cow, I couldn’t easily pick out his body. We stalked a little closer; the bull was in the open now. I could see now, but we didn’t want to shoot and then have to track in the dark. I had called off the first shot opportunity and Johann had called off the second shot opportunity. I think we both made the right decision. Tomorrow, we’ll hunt some more. I just finished dinner. We had gemsbok steak, scalloped potatoes, squash filled with cream corn and topped cheese. Today didn’t start well. I woke up and my stomach wasn’t well and my allergies were slightly acting up. I took imodium and zytec. The medicine worked well. The worse news is that Johann is not well. He didn’t sleep well, had fever/chills and now has a headache. He is concerned about malaria. Yesterday, on the way here I asked him if he took a prophylaxis for malaria. He said “No, we can’t be on the medicine forever.” Later he told me that the medicines to treat malaria are quite good. A neighbor had been diagnosed with malaria. He was given 3 pills and was doing great in 1-2 days. More on this later. We left for our hunt at 5:45 am. It was a little cool. I was glad for my sweatshirt for the drive. We went past the same waterhole where we saw the kudu last night. As we approached, a herd of zebra were leaving. We watched them head toward the mountains. Johann said he though he knew where they were going. We went a little further and saw a young kudu bull, not a shooter. We continued to a place where we could climb a koppie to look and listen for the animals. We could see the dust in air where zebra were taking a dust bath in the extreme distance, probably around at least a mile away. Tjokkie heard some zebra so we went to a different koppie to look around. We stayed there for a while. Tjokkie went to a neighboring koppie around 75 yards to my left. We heard Tjokkie whistle. When I looked down, I saw a zebra. I pointed it out to Johann. It was approximately 200 yards away standing under a tree with only the front ½ of its body visible. Johann wanted to make sure that is was a lone stallion. It was. It started walking toward us. When it was 170 yards from us (we later used a range finder). Johann tells me to shoot. I have an excellent rest. My gun is resting on a GIANT boulder and I’m standing with my body wedged between some of the rocks. At the shot, Johann calmly says “You’ve missed. Reload and fire again.” I said “What? !” I had a great rest and there is no way I should have missed. 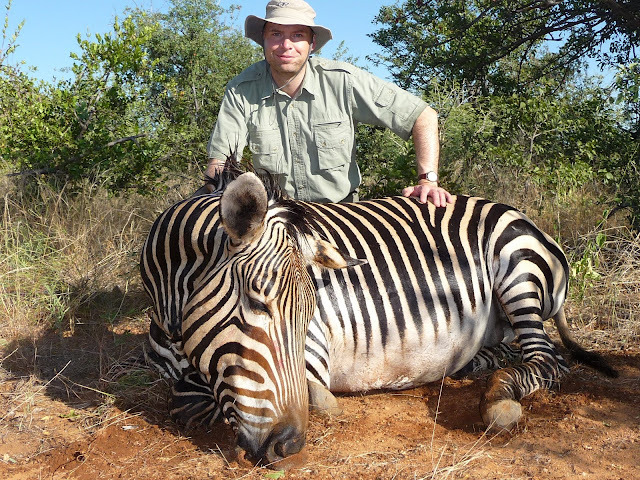 Johann says “You missed.” I reload and get the zebra back in my scope just in time to watch him fall down. I had a clean pass-through and Johann had seen the dust fly up behind the zebra. My zebra hunt was over. I ribbed Johann about the “You missed” statements more than once. When we get to the zebra, the shot placement was pretty good. The exit wound was slightly lower and in front of the top of the triangle at the top of the leg. We prepared the scene and took the pictures then the fun started. We quickly learned that the winch on the truck was broken so we had to manhandle the zebra into the truck. Johann decided to try to use the come-along and we were finally able to get it loaded. At 8:30, we were headed out of the mountain. I watched them skin and gut the zebra. The stomach was enormous. We had a great lunch – spaghetti with a well flavored and spiced meat sauce. We’ll leave for kudu hunting at 4:00. This afternoon’s hunt wasn’t as fun or exciting as this morning’s. We went to a couple of lookouts to try to see kudu; we only saw zebra. 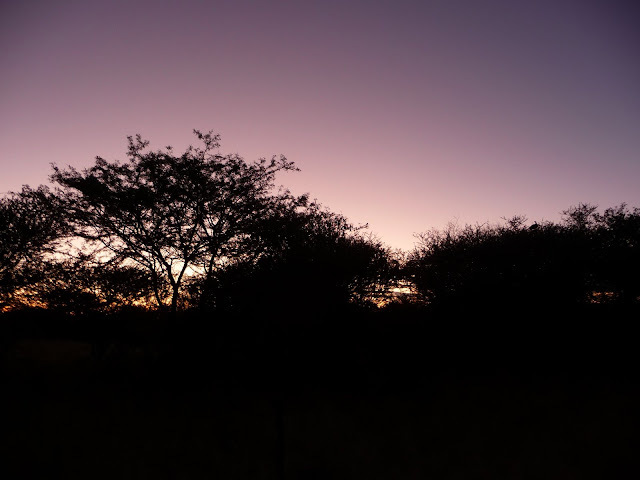 Near last light, we stalked in to the same waterhole where we saw the big kudu last night. One the way in we saw 2 bulls; one was an old bull but was not a good trophy, the other was young. The young walked with 25 yards of us. We saw lots of zebra this evening. The first one was very young and dumb. We watched it for several minutes and Johann decided to chase it away. He walked to within 25 yards of it. He called me over and I got lots of pictures of it. We probably saw 45-60 zebra tonight. Tonight’s dinner was beef and gemsbok stew over rice. It was good. I hope Johann is better in the morning. Johann is no better and went to Outjo to see a Dr. Today I hunted with his father, Vellies, and Tjokkie. Before we had gone too far, Tjokkie saw a big kudu bull but we could never get into position to take a shot. When we were stalking it, a kudu cow busted us and started barking. For several minutes, there were kudu barking all around us. We left there to find more kudu. We glassed at several locations; we saw zebra and gemsbok but no kudu. After we left the one koppie, we drove around it and saw several kudu. There were cows and two bulls. Vellies and Tjokkie were talking among themselves. Finally, Vellies says “Do you see the big bull?” Tjokkie throws up the sticks and I chamber a round get ready to shoot. The kudu was walking up the mountain almost directly away from us. The animal never stopped. Tjokkie and Vellies whistled for it to it stop but it crossed over the top of the mountain. Tjokkie and I started out to stalk it. We never could get a shot off at it. Johann came back from the Doctor and is feeling better. He went out with us this afternoon. We went upstream in the Huab. The terrain is completely different. It is shaded with large trees. Where the breaks come to the river, there are lush grass plains. For awhile, we were walking in grass that was taller than I am. We walked for awhile to find a place where we could watch the plains. We saw a young kudu bull, many zebra and 5 warthogs. Johann saw a herd of kudu on an adjacent mountain. We tried to cut them off but we were too late. They were already in the tall grass when we walked past. We were busted and the sound of barking kudu filled the air. Johann says that we’re going to try something that he’s never done before. We’re leaving camp on foot and climbing the mountain directly behind the lodge. We hope to be in place at the top of the mountain near first light. I just got back from dinner. Tonight we had kudu tenderloin stuffed with cheese, onions, mushrooms and spices served with potatoes and sweet potatoes. The sweet potatoes are white instead of orange. For dessert we had a baked rice pudding. The kudu was excellent. My kudu hunt is over!! This morning at 8:30 I shot an old kudu bull. Not the biggest bull in the world but I’m extremely happy with both the hunt and the animal. This morning we left camp on foot and climbed the mountain directly behind the lodge to look for the kudu we had seen on my first night at the lodge. The wind was not good and we didn’t see anything in the first valley. We climbed down from our first vantage point and climbed another koppie to look from there – still no kudu. I think there was another mountain but the morning is running together in my mind. After we were done looking around the mountains behind the lodge, Johann decided to walk over to the waterhole where the big kudu had been seen. As we walked, we saw a couple of kudu cows. We also saw a warthog sow with 3 young. They were only visible because they were in an area where the elephants had recently fed and the grass was trampled. They eventually winded us and evaporated into the high grass. We climbed the koppie that was near the waterhole and tried to spot kudu. At 8:15, I figured that the morning hunt was over when a kudu bull appeared around 600-700 yards away. While trying to get a better look at the bull, we rearranged ourselves and in the process noticed a bull standing in the open not more than 150 yards away. He stood out like a turd in a punchbowl. Johann calmly asks “Do you see him?” I laugh. Now the problem is, which bull should we go after? Johann glasses the far bull and concludes it is a sick bull that looks young. More on this later. The bull that is closer to us continued to feed unaware of our presence. Johann asks if I want to shoot from the koppie or get down and stalk him. He says that the wind is starting to swirl. Given this and the fact that I’ve really enjoyed the morning’s hunt, I thought I should shoot. I asked “Is shooting from here the smart play?”. Johann responds “It is the safe play.” I decide to shoot the kudu from here. I chambered a round, placed the rifle on a rock and prepared to shoot. As I was ready to shoot, the bull immediately turned away from me. It eventually turned so it was facing to my right. With my scope set at 4.5x, I took my shot. The bull was visibly hit. Johann said “Nice shot. Reload.” The bull turned and walked away from me with his tail up – a sign that a kudu isn’t normally long for this world. Just as he’s about to enter some brush, I shoot again as he’s angling very hard to the right. The shot sounded like it hit hard. I reloaded again and was ready to shoot when I saw the bull fall down. We had hunted on foot for 2.5 hours. We walked over 4 km and climbed 3 or 4 mountains. 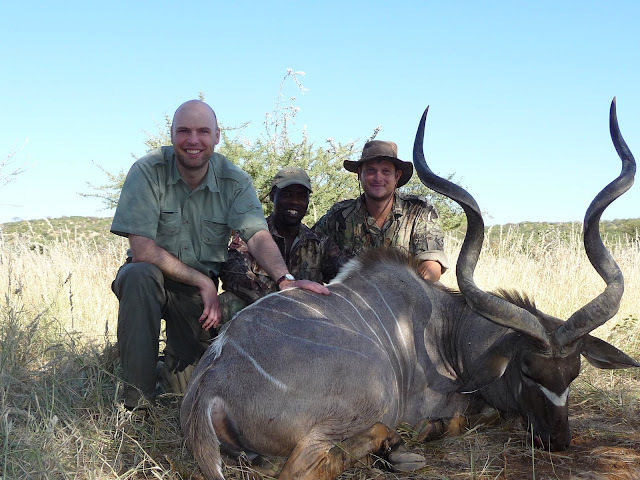 At the end of the hunt we had taken an old kudu bull. I was thrilled. We took some pictures. When we were done, Johnas and Tjokkie loaded the animal while Johann and I went to look for the sick (rabies) kudu we had seen from the koppie. Rabies is a problem in Namibia. In the past several days, we’ve seen 4-5 carcasses from bulls that most likely died of rabies. We looked for the sick bull but were unable to find him. Johann could tell he was sick by the way that he held his head up high as if he had a stiff neck. 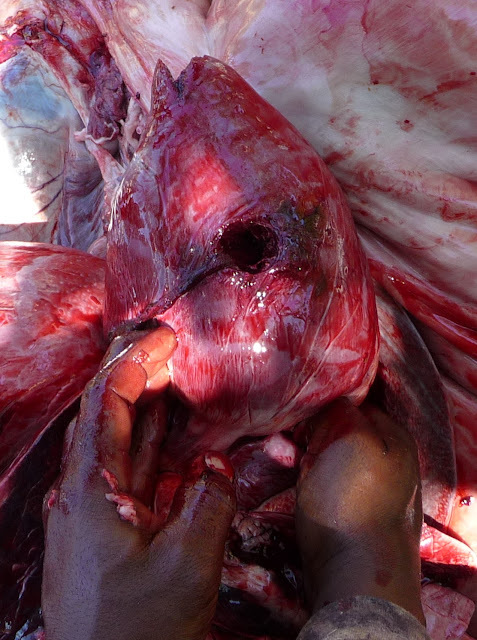 As they skinned the kudu, I could see that my first shot was too far forward hitting only the front part of a single lung. It would have been fatal, but it would have likely required some work to get him in the back of the truck. The second shot was perfect. It entered behind the rib cage, traveled through the stomach and through the center of the heart. I hope that Vellies recovers the bullet for me during the butchering. I am VERY glad that I had my 338 instead of my 7mm. I doubt that the 7mm would have made it to the heart. Johann estimated the bull’s age at 12-13 years and its weight to be 850-950 pounds. At one point, Johann thought he would go 50”. When it was on the ground he was thinking 48”. I really don’t care about the size. I really enjoyed the hunt and harvested a mature animal. It will be the biggest kudu in the house. I’ll rest until 3:45. This afternoon we’re looking for a cull gemsbok for the kitchen. This afternoon was nice. We stalked some gemsbok but were unable to find a cull. We watched a couple of gemsbok bull for awhile, which was fun. While driving to get in place to stalk the gemsbok, we saw a really big kudu bull. It’s here for another client. I’d rather have my bull after an honest hike than jump out of a truck and shoot a bigger animal. Dinner tonight was chicken and peaches over rice with German-style red cabbage. For dessert we had an apple “pie” that was like an apple crumb pie. Everything was delicious. This morning we visited a Himba village. A story about this village can be found here. This afternoon we took a drive around the northern part of the property. We saw lots of leopard tracks but not much game. We saw a single kudu and 3 gemsbok. As we were returning back to the lodge, we saw a very nice kudu bull. It was bigger than mine. Oh well. For dinner we had zebra skewers. The fillets were wrapped in bacon and cooked over the fire. The zebra was outstanding. It was served with couscous and a cauliflower/cheese dish. Dessert was a cappuccino flavored flan. Today was a trip to Etosha. I watched yet another spectacular African sunset. I am saddened that I’ll only see one more sunset at camp before I have to go home. I desperately miss my family and hope to find a way to bring them with me when I return to Africa. Dinner last night was zebra schnitzel, mashed potatoes and spinach with feta cheese. Dessert was a custard pie. Everything was delicious. This trip is winding down. This morning, we went looking for a cull gemsbok. It was much cooler this morning. You could see your breath in the still morning air. Tjokkie was underdressed. I gave him a pair of gloves to help keep warm. He was very appreciative. We went to the lookout pavilion. While there, a baboon made us out and started barking. I later saw him sitting at the top of a tree on the adjacent mountain. We climbed another small mountain to glass for gemsbok. We saw a herd that was stalkable. We proceeded to climb down the mountain and to close the range. We were crawling on all fours in a river bed. The wind shifted on us and with the herd still 100 yds from us the herd smelled us and ran. Tjokkie threw up the sticks. He and Johann both said to shoot the one that was standing. Unfortunately, there was an overhanging tree branch that obscured my view of the gemsbok. They moved the sticks so I could see and the animal ran away. This is the end of my hunting on my first African safari. After the blown stalk, we walked to a waterhole. On the way there, we saw some vultures. That could only mean one thing – another rabies casualty. Sure enough, the same bull that we had seen when I shot my bull was dead. It turned out that it was really old bull; however, its horns were both broken off making it look like a young bull from afar. 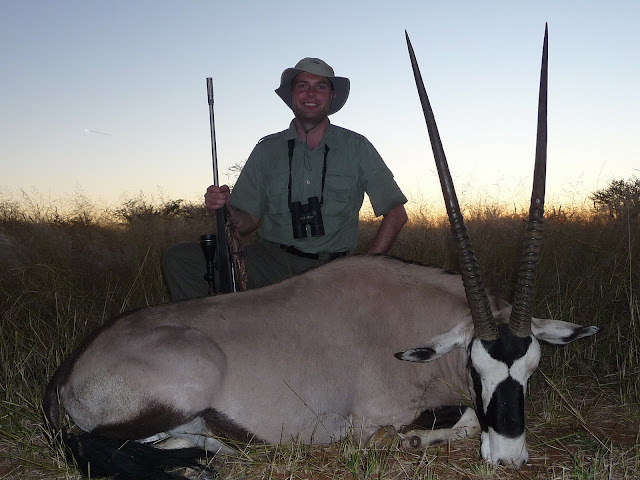 I feel bad for Johann and all of the Namibian outfitters because rabies is killing a lot the kudu bulls. Johann started my paperwork this morning. This is another sign that the end of my trip is near. 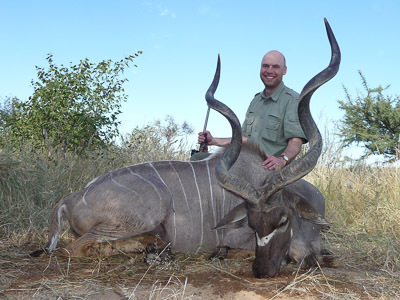 He went and measured my kudu. I was expecting 48-50”; the longest horn was 51.5” (130.9 cm). The horns had a circumference of 11.4” (29 cm). I am even more ecstatic with my trophy. This afternoon, I’ll pack and take pictures. And so it ends. Tonight we went and took pictures at the locations where I shot the zebra and kudu. We saw kudu and gemsbok in our travels. We had a sundowner near the dam. While we were having the sundowners, I gave Tjokkie a set of knives in addition to the cash tip I’ll be leaving. He seemed extremely happy with the gift. Tomorrow I’ll start my journey home. I checked my GPS and my home is 7325 miles away as the crow flies; but it is much more than mileage. This will be a trek that takes me back to a different place – A place with my family, my work, my life. So tonight I said “Goodbye” to the Africa that I’ve richly enjoyed for 10 days. It is time – time to reengage with my life, reinvigorated, with a different perspective and content in the knowledge that I’ve fulfilled a dream. I hope to bring the family over in a few years so I can open their eyes to the many wondrous sights that I’ve seen on this trip.